This walkway/patio was one of those tricky designs on paper that you hoped would work out on the ground. It’s like I draw this to exact scale, knowing the materials we are using . . . and hoping the field guys can implement the plan correctly. I knew when I drew this and presented it to the clients that this could look really great in their back yard, I mean really great. I believed one of the keys was making the sandstone work into a good strong pattern. Luckily for me the supplier was able and willing to give me the sizes I wanted, at the dimensions I wanted. So the stone could be scaled out exactly the way it would w0rk in the space shown. The slabs were cut in some ratio of 12 inches. so the pieces were 1×2, 2×2, 2×3, 1×4. This also cut down on waste; everything was scaled out, laid out, on paper. That way I knew exactly how many of each piece we needed. I remember we picked up 2 extra of every size in case of breakage, chipping, whatever. These extras were latter used underneath a pergola swing. After the sandstone walkway was laid out it was a simple matter of laying out a couple of large circles of brick to interact with the sandstone. I remember moving the circle template around to try and find some sizes that would fit the scene . 1st starting with the largest circle and working to fill in the blanks with the smaller circles; or , slices of circles. 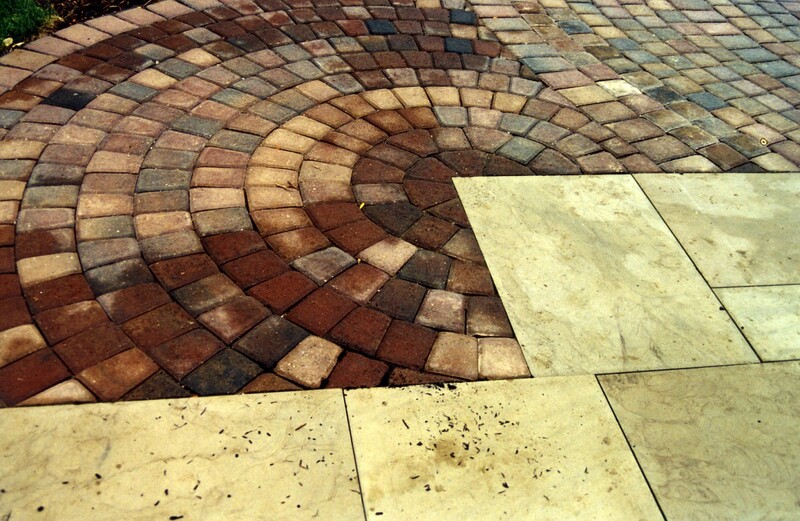 The tri-colored dark pavers are a strong contrast to the tan sandstone slabs. So . . . even with the strong color contrast, a contrast that was, to me very powerful . . . the stone and pavers flow together. I guess you could say the scene is harmonious . . . without being harmonious. A side note: Over the last few days I had wriggled my way in to a cyberspace argument on planning, specifically . . . why planning is a myth, or bad somehow. I think the above post is a perfect example/explanation of the design process, and is the perfect response to; why design is important, and believe me—-Design is important. If you want to move a perennial around, or buy a shrub on a whim . . . go ahead. I just wouldn’t recommend buying 7 tons of stone on that same whim.